Jazzpunk is a comedy video game. It's not a first person shooter, or adventure game, or any other traditional genre. It's an interactive experience that functions solely to get a laugh or smile, and its game mechanics either set up the punchline or are part of the joke. Set in a bizarre alternative universe, Jazzpunk stars a secret agent named Polyblank, who you guide through multiple missions in a bizarrely anachronistic world. The themes are 50s and 60s spy movies with evil Russians and Bond style villains, but there's also cyberpunk technology and flying cars straight out of the Jetsons. All characters have the same shape as the silhouettes that mark bathroom doors, and they all make constant puns that imply they know they're in a computer, or at least partly electronic. It's Get Smart if Mel Brooks was obsessed with computers and further deranged. The world makes little sense, then, which is entirely the point. Reality warping medications send the protagonist hurtling into each adventure, with simple instructions to complete, like retrieving secret documents or experimental technology. It quickly becomes apparent that the main point of the game is not to complete objectives, but to explore every environment and try to interact with every detail. Everything is a potential toy, and even random filler characters often have multiple lines of dialogue. Controls are quite simple. The world is experienced from the first person perspective, and navigation is the same as any run of the mill FPS. You can jump, the mouse wheel changes between the few items collected, and the left mouse button is used to interact with everything. Occasionally the game mechanics change completely to become an homage to Frogger or ubiquitous zombie games, but it never feels unclear what you're supposed to do. Even if it takes a moment to understand the shift in play, there's really no way to fail in Jazzpunk, so it doesn't matter anyway. 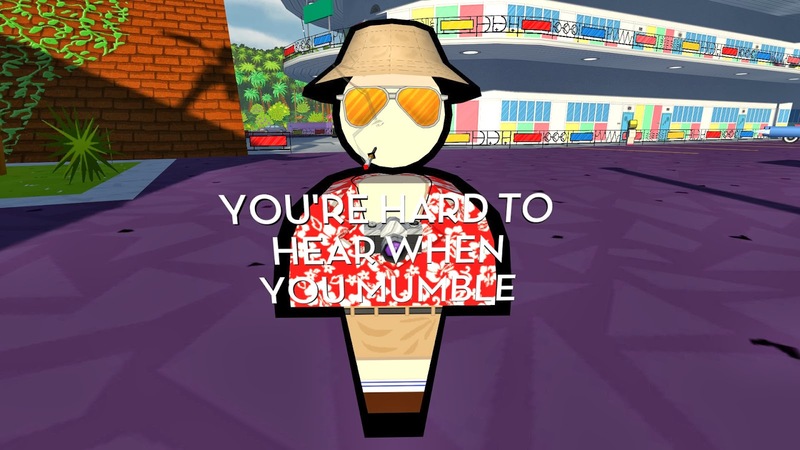 That lack of failure states and traditional gameplay has led to a lot of criticism that Jazzpunk is inferior for being "just funny." It's part of the assumption that video games have to provide some challenge, or at least some kind of mechanical roadblock for players to overcome. Games are increasingly confronting that notion, using the interactive possibilities to tell a story, not pose a challenge. Gone Home and Thirty Flights of Loving, among others, have blazed a trail for more dramatic narratives, and Jazzpunk does the same for comedy. 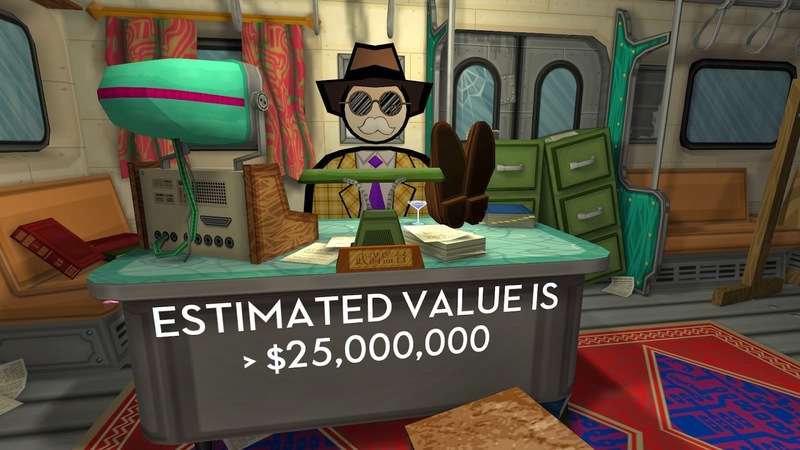 Unfortunately, Jazzpunk's random world also extends to its humor. The game's publisher is Adult Swim, and that network's trademark absurdist humor is a heavy influence on this experience. The overall narrative is nonsense, of course, but it also has no internal logic of its own. Each mission is barely connected to the others until the finale, and even then there is no investment other than getting to the next joke. If the jokes were more consistent, that might not be a problem. Some of the moments are inspired in their elaborateness, like a parody of old school first person shooters called Wedding Qake. Others are amusing references, such as a tropical resort infested with Hunter Thompson look and sound-alikes. The random nature of the humor means that it often falls flat, and all the references and bizarre non-sequiturs grow tiring without context, making the game's short duration a blessing in disguise. There are some other problems as well. The music of the game utilizes strong, repetitive themes to set the tone. They work perfectly, but become extremely irritating after exploring an area for more than a few minutes. The game also has no field of view slider, inducing motion sickness in some players. It's hard to laugh with a bad headache and a queasy stomach. 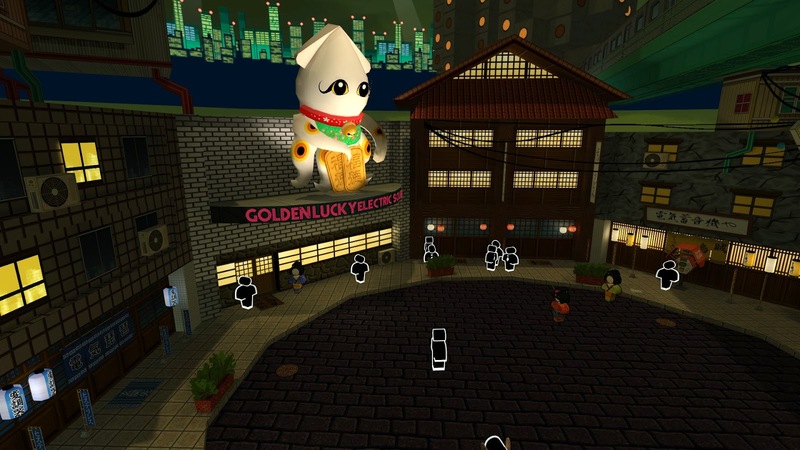 For all its faults, Jazzpunk is still worth experiencing at least once. The environments are often beautiful in their own minimalist way, and the humor is so random that you're almost guaranteed to laugh at something. 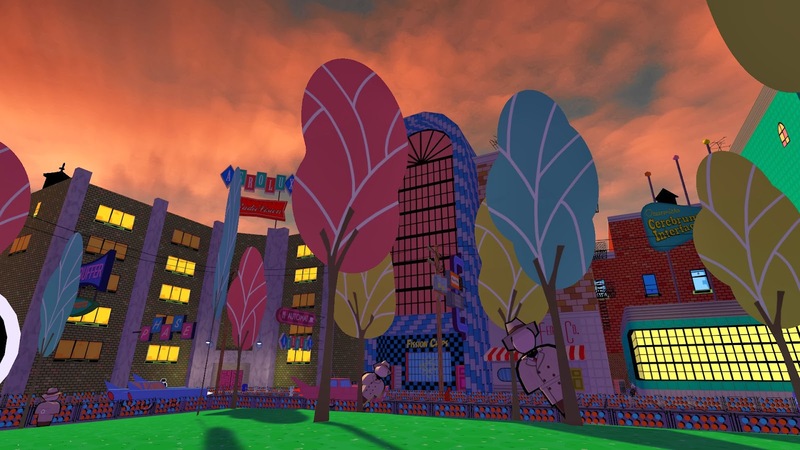 Unlike a Monkey Island or Borderlands 2, games that used humor to enhance a traditional experience, Jazzpunk makes its entire world the joke. Hopefully more developers will attempt the same thing in the future.